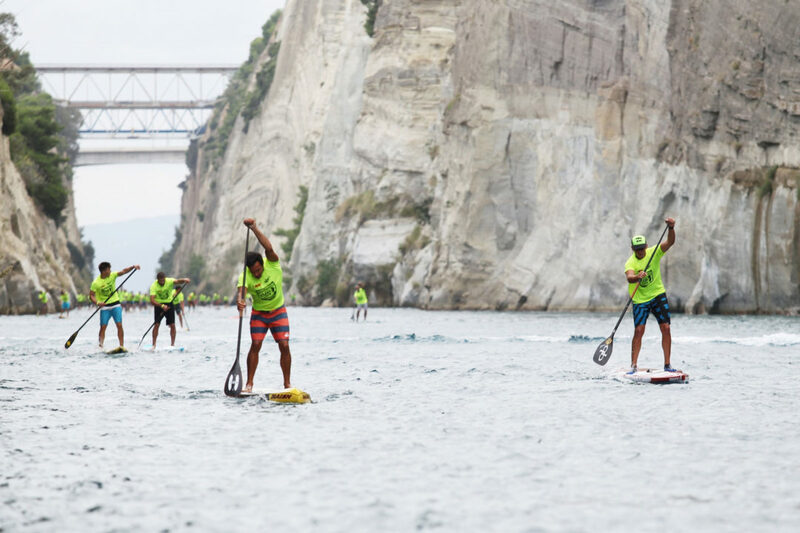 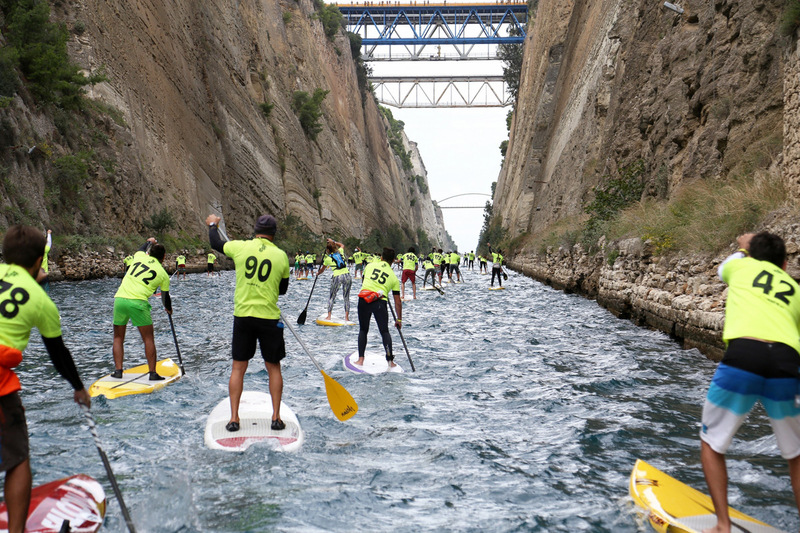 On Sunday November 1st 2015 and 13.00 p.m. naval traffic inside Corinth Canal was stopped, for the great final of the 5th Hellenic SUP Cup 2015. 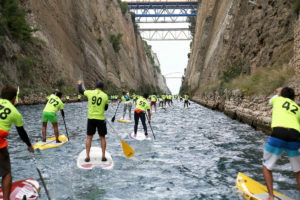 More than 150 Stand Up Paddlers lined up for a 6.343m crossing of the historic canal, offering a rare sight to the most. 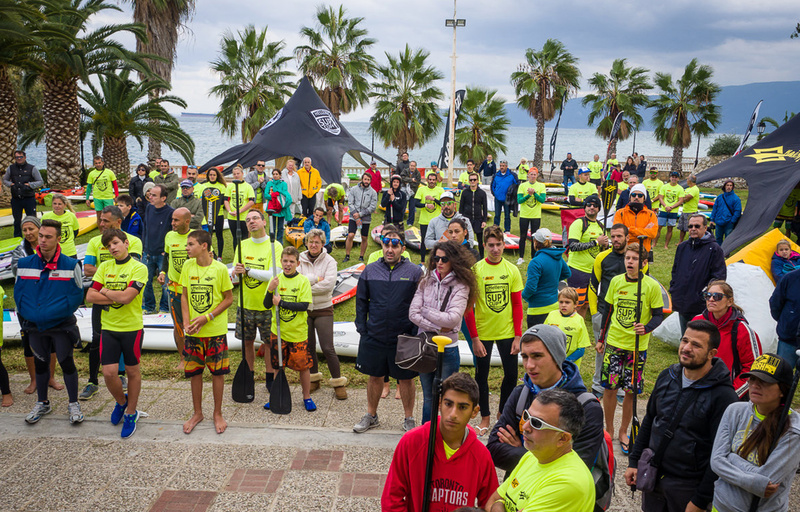 The weather cloudy, the wind strong 25-30 Knots and the temperature really low, organizers were facing the worst case scenario, just one day before the race, which was postponing or even canceling the race. 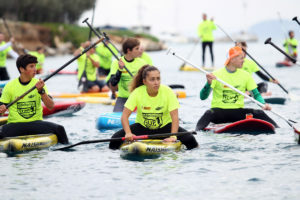 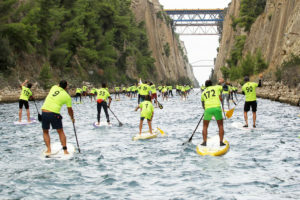 Such thing was not an option for them as more than 150 participants had signed up for the race, not only from all over Greece but also from other European countries. Then the only problem that had to be solved was canal’s current. 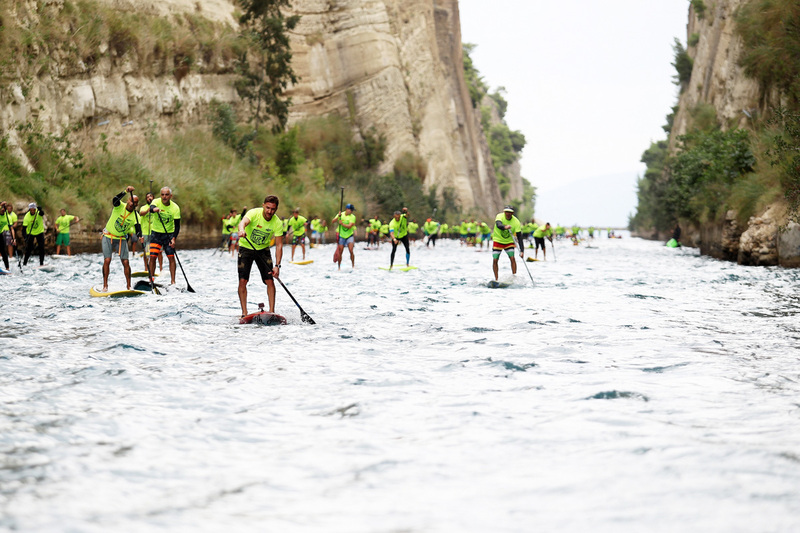 During the previous week the current was changing direction every 6 hours as usual. 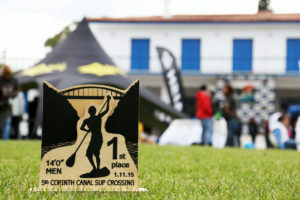 But this had changed, due to the strong N-NE winds blowing at Corinth two days before the race. With the help of the Canal’s personnel and their experience, organizers managed to postpone the start of the race by 2 hours. 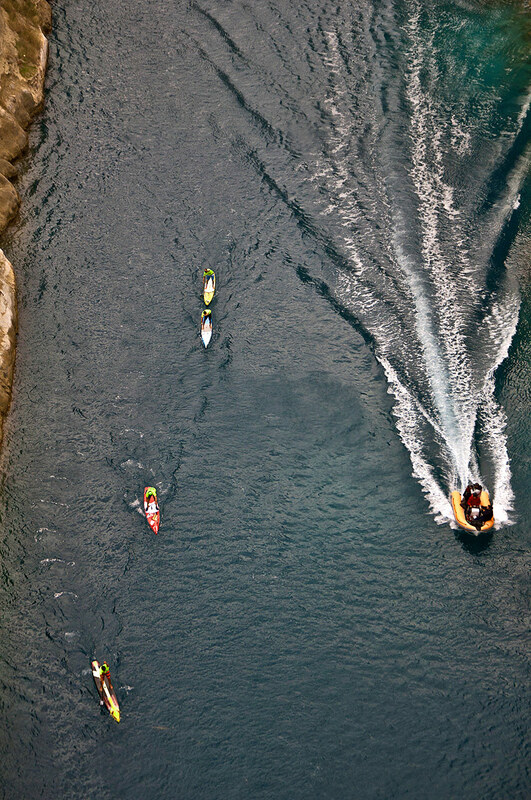 Just enough time for the current to change and do everything as planned. 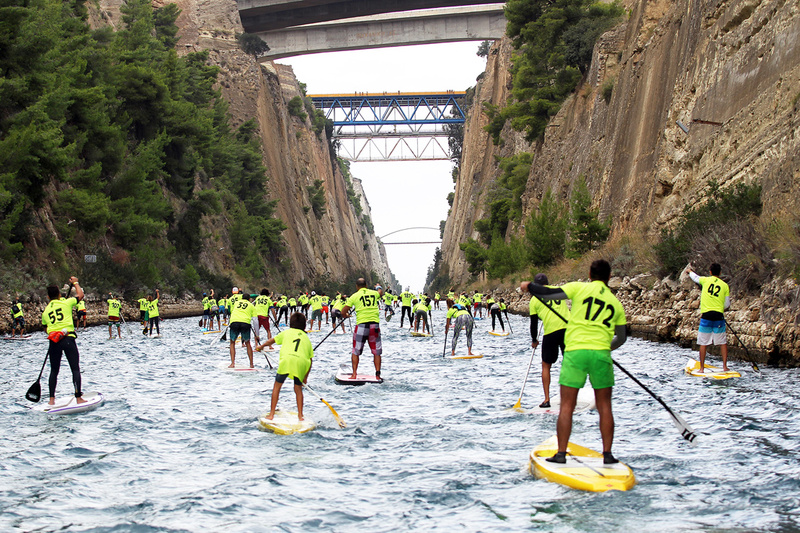 World’s “straightest” race of 6.345 meters has just begun. 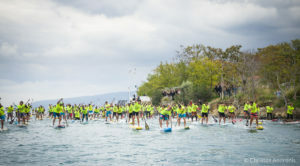 The sound of paddles hitting the water was covering the cheers from the crowd watching the race from the shore across the canal. 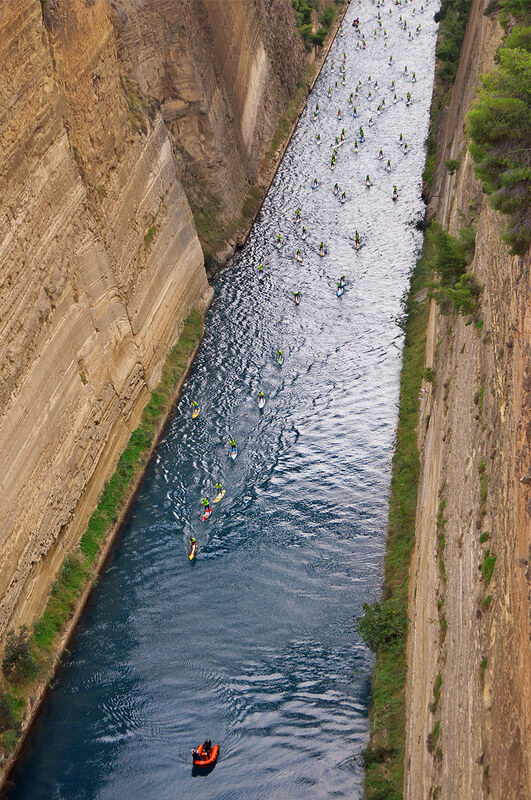 The wind was still strong above the canal, making turbulences inside. Blowing sometimes in favor, other against and other on the side, paddlers had to adjust their technique and strategy to overcome these every-minute changes. 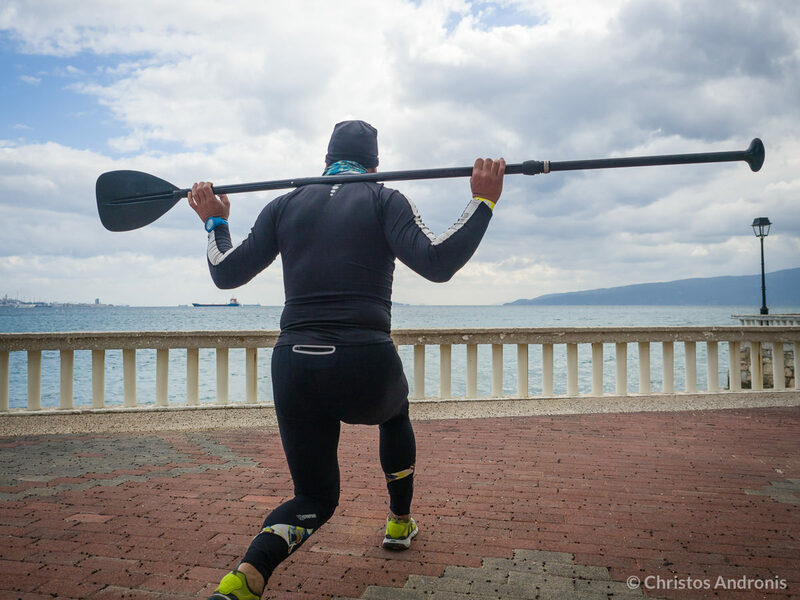 After the first 500 meters where the distances were made and everything became more clear…SILENCE. The incredible silence that rules inside the canal with these massive (80m high) vertical walls. 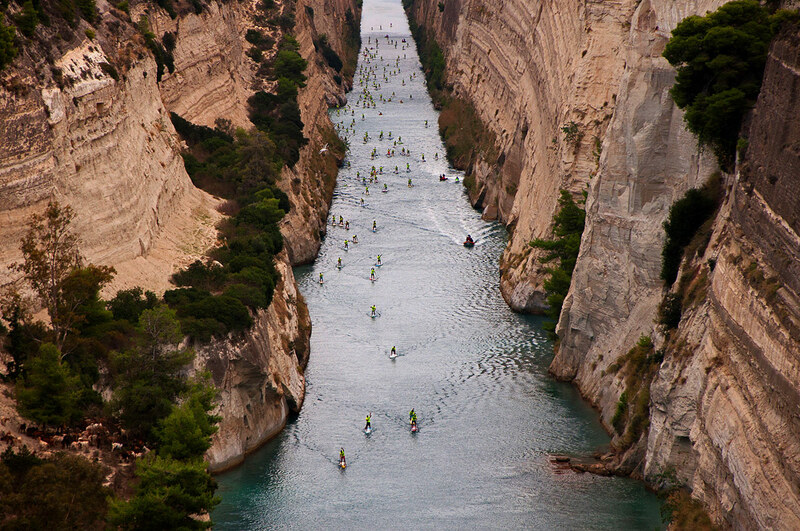 Only heavy breathing from paddlers, trying to find their pace. 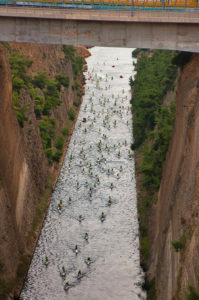 Great battles were given and many overturns occurred throughout the whole length of the canal, with paddlers facing the strong gusts of wind either against, make them literally to stop, either on the side make them to decline from their route. 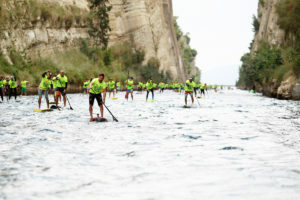 Despite all challenges that had to be faced, everyone kept their pace and gave their little own battle until the finish line. 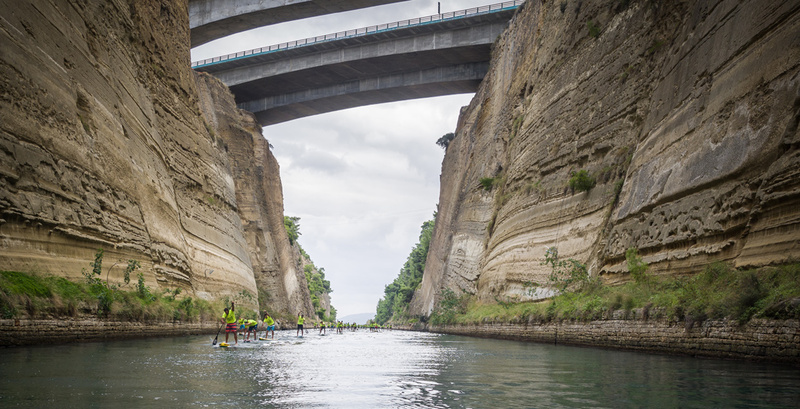 The last part of the race was the most difficult, as the wind was blowing furiously (25-30 knots) at the exit from the canal and just a couple hundred meters from the finishing line. 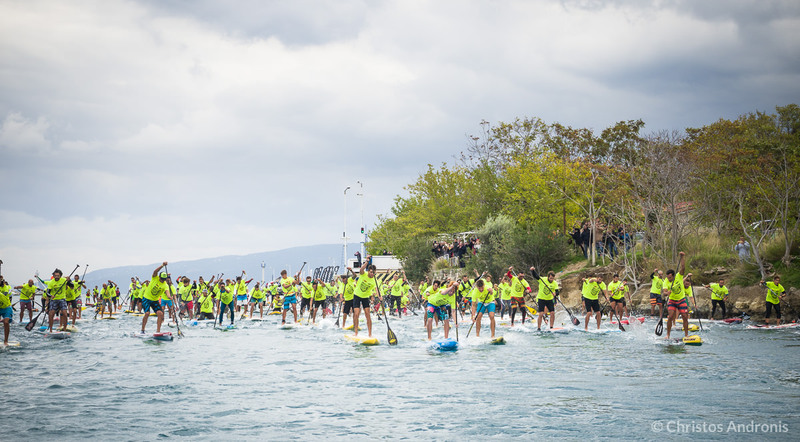 Great scene of the race was the two last kids (8y.o. 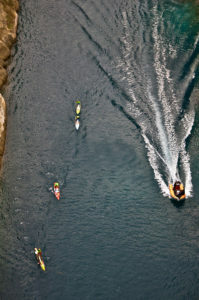 and 10y.o.) 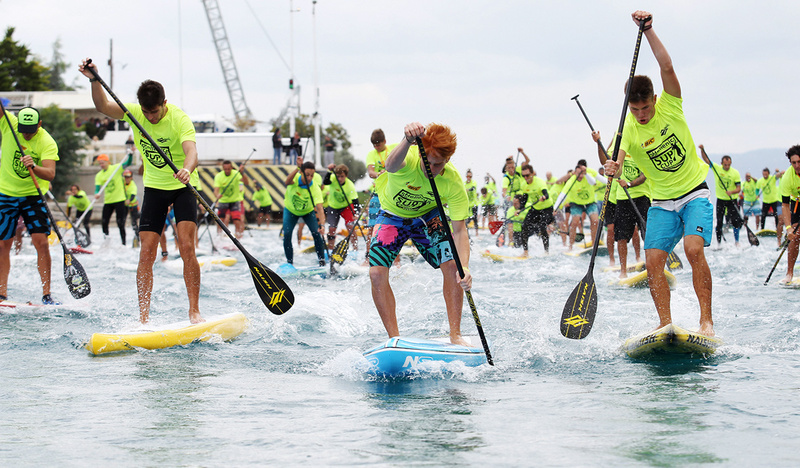 finishing the race in cheers from the crowd watching but also from all other competitors. 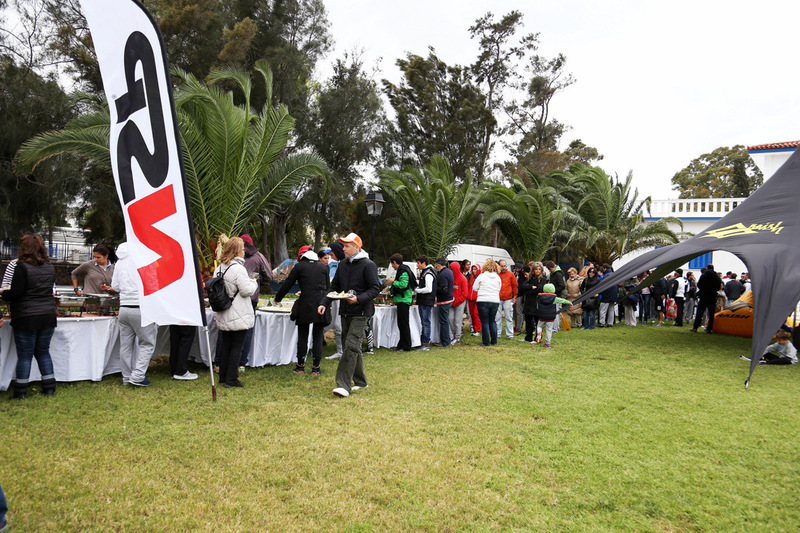 After the race the athletes were transferred back to the start with busses, where they had lunch inside the beautiful garden of Canal’s management building (Α.Ε.Δ.Ι.Κ). 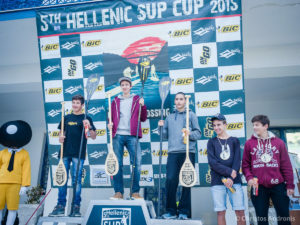 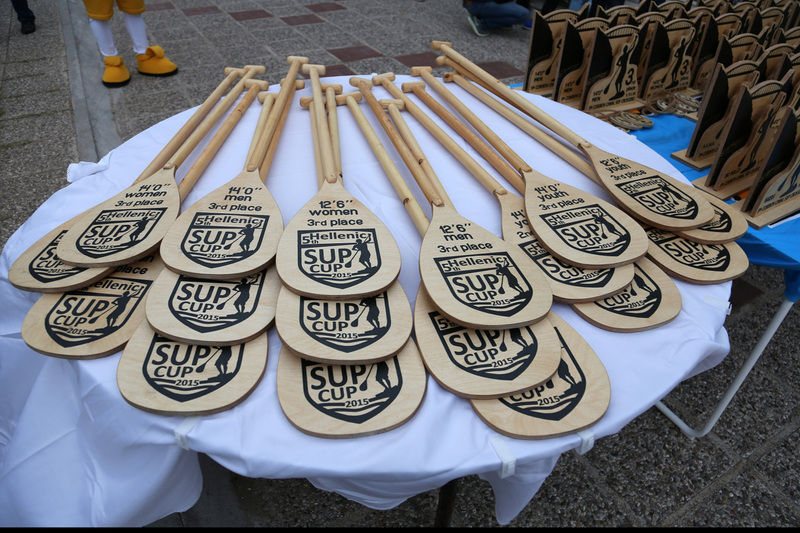 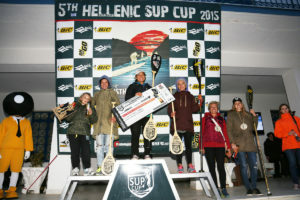 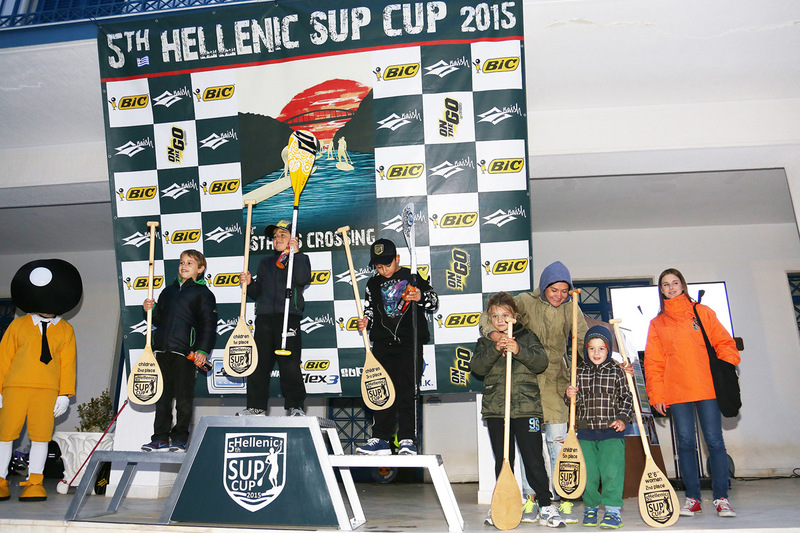 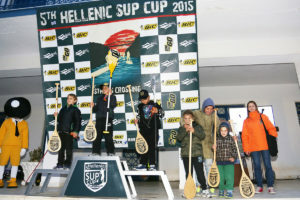 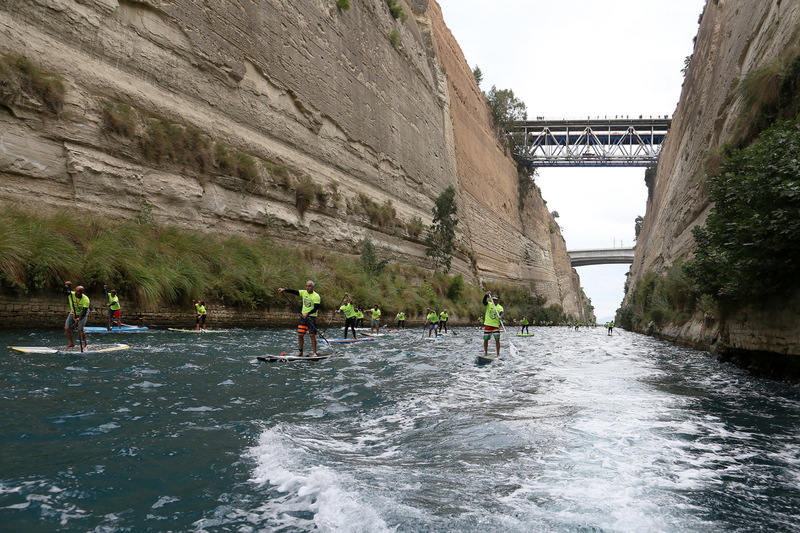 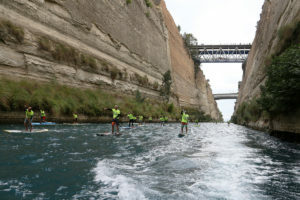 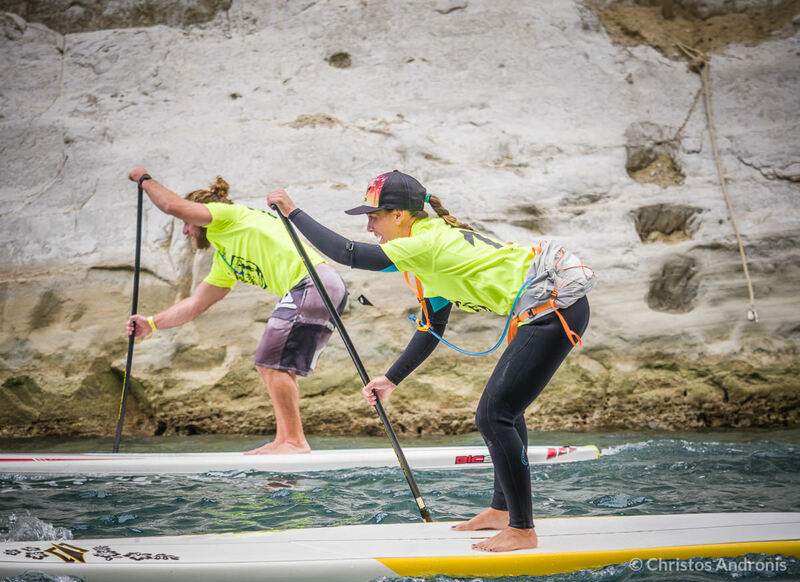 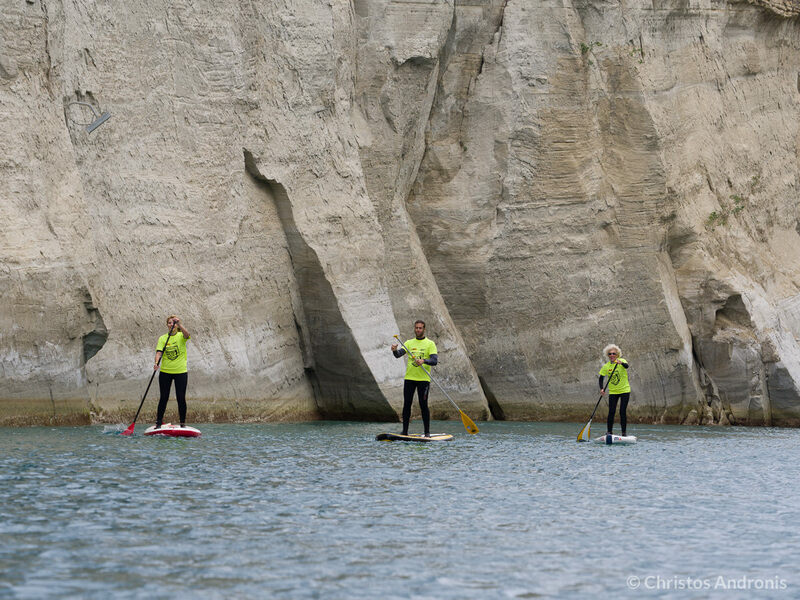 The time for the award ceremony of the 5th Hellenic SUP Cup 2015 and Corinth Canal SUP Crossing had finally come. 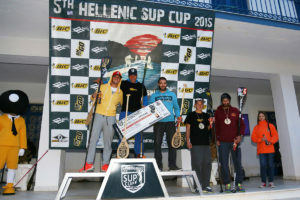 Winners from all categories were awarded. Among them also the oldest (Master) and the youngest (young gun) paddler. 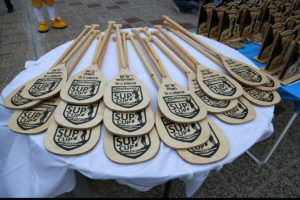 Organizers had planned also 4 big prizes for the winners of Men and Women in14’0” and 12’6” categories. 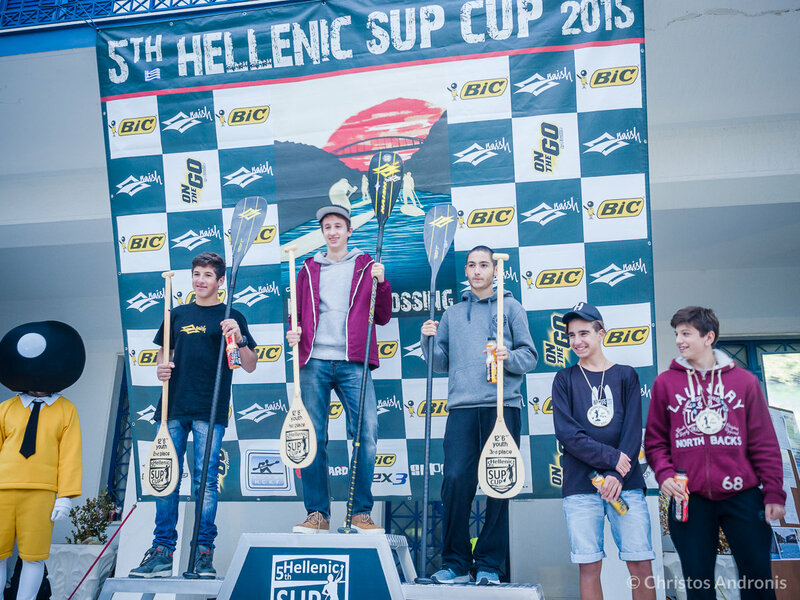 Each of them won a ticket to Nautic Sup Paris Crossing on December 6th.